A broad artistic movement of the 1920s and early '30s that involved literature, the visual arts, and music, the Harlem Renaissance was one of the most productive eras in American literary history. Concentrating on the literary side of the movement—the writers, works, periodicals, editors, publishers, critics, and related topics—Encyclopedia of the Harlem Literary Renaissance provides authoritative coverage and unique insight into the literature of the Harlem Renaissance. An easy-to-use resource for students, general readers, and scholars alike, this volume is rich in material on this important literary movement. More than 800 concise, A-to-Z entries detail the historical relevance of the subject and explain how the writer, work, or idea helped fundamentally reshape American literature. The author draws on historical studies, biographies, literary criticism, and primary materials, including letters and diaries of such Harlem Renaissance figures as Langston Hughes, Jean Toomer, W.E.B. DuBois, and Zora Neale Hurston. The book also includes a chronology, a list of works by Harlem Renaissance writers, 35 black-and-white photographs and illustrations, cross-references, a bibliography, and an index. Many other significant terms and topics that are important to understanding the movement. "The articles are descriptive and interesting to read for the context they provide and will be helpful to students in high schools and colleges and public library patrons." "...an important mainstay for either high school or college-level literary holdings." "The volume is well researched...a worthwhile purchase for public, high-school, and undergraduate collections." "From historical studies to literary criticism, primary source materials and quotes throughout make [this encyclopedia] an important mainstay for either high school or college-level literary holdings." "...has several advantages over others on the subject: it is lighter and cheaper, but for all that, authoritative, with 800 alphabetically arranged articles on writers, their works, periodicals, editors, publishers, critics, and related topics...comprehensive...this is the book this reviewer would carry around to see the sights...Highly recommended." 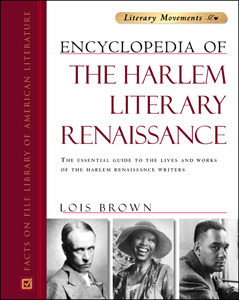 "The literary and artistic endeavors that characterized the Harlem Renaissance are carefully cataloged in this well-documented, comprehensive volume." "...a helpful guide...Researchers will benefit from [the author's] use of newly uncovered primary material...recommended for public and academic libraries." "This resource for students, general readers, and researchers provides quick access to information on the literature of the Harlem Renaissance." "Written in clear and concise prose...The A-to-Z arrangement and single-volume format enhance this book's usefulness as a ready-reference source. Also useful are the separate primary and secondary bibliographies as well as a brief chronology. Highly recommended for all literature collections..."